SAN DIEGO, CA, July 01, 2017 /24-7PressRelease/ — Jackson Design and Remodeling (JDR), a leading design build remodeling company in San Diego, is excited to announce its team has won a coveted “Kitchen of the Year” award in San Diego Home/Garden Lifestyles 26th annual competition. The award winning kitchen is in a 1939 Colonial-style home by renowned architect Thomas Shepherd, well known for his work in La Jolla. JDR’s design is featured on the cover of the June issue with a feature spread inside the magazine. Designed by JDR Senior Interior Designer Tatiana Machado-Rosas, the Fresh Traditional kitchen respects the original nature of their home while significantly increasing storage, improving navigation, and creating a stylish kitchen and breakfast nook with a more spacious feeling. One focal point is a navy blue walnut cabinet custom built to house the refrigerator and side pantries. A quartz “Taj Mahal” countertop was selected for the island in a leather finish with a hint of blue for a rich look that echoes the color of the navy blue pantry cabinet. An intricate marble inlay above the cooktop reflects the pattern of the adjacent door. The backsplash wraps the entire room and is composed of marble tiles that communicate the traditional aesthetic of the home. Along with Machado-Rosas, Design Assistant Priscilla Jimenez, Residential Designer Arnold Gaza and Interior Stylist Karina Kmiotek Ally made up the award winning kitchen’s integrated design build team. 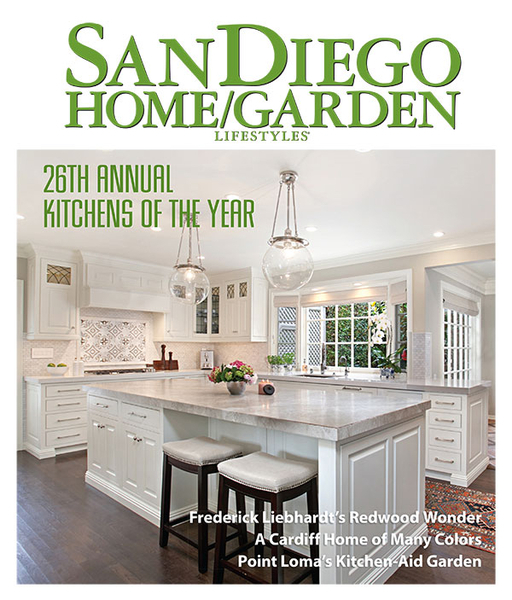 The annual “Kitchens of the Year” issue of San Diego Home/Garden Lifestyles is highly anticipated each year. Designers from across San Diego submit their best projects, which are then judged by an independent panel of editors and design industry leaders. JDR is among a total of four Kitchen of the Year winners for 2017.